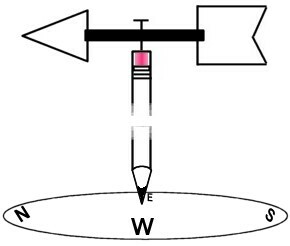 A wind vane is a tool used to tell which direction the wind is coming from. Weather vanes are usually found on top of buildings so they will catch an open breeze. Look for them on top of barns, houses, weather stations, hardware stores, and other places that sell or use weather tools. The part of the vane that turns into the wind is usually shaped like an arrow. The other end is wide so it will catch the smallest breeze. Sometimes a metal rooster or other animal sits on top of the weather vane. Cut the point and tail of an arrow out of an index card. Tape them onto the ends of the straw. Push the pin through the middle of the straw. Stick the pin into the eraser of the pencil. Make sure the straw can turn freely.